A trip to the dentist with an autistic child can be difficult. Not only are there the usual fears associated with strangers who put their hands in your mouth, there are also strange sounds, tastes and sensations, bright lights, and occasional pain. But there are things you can do find the right dentist and help prepare you and your child for a dental appointment. Not all dentists are comfortable with kids on the autism spectrum so finding the right dentist is crucial. 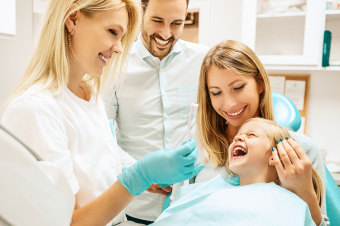 Ideally, the dentist should have experience with special needs children, but even then it's worth your time to ask questions and get as much information as you can. Once you find a dental practice that seems like a good fit, talk to the dentist in advance of the appointment so you know exactly what to expect, and can tell them a bit about your child. Find a book or video to show and tell your child what will happen at the dentist's office. Review it often before you go to the dentist, and even bring it along when you go. Consider borrowing some basic dental instruments so that your child can see, touch and interact with them before going to the dentist. Visit the dental practice in advance of the appointment to get them familiar with the new setting and faces. If your child has a problem with bright lights or loud noise, bring along sunglasses and earplugs. Come prepared with the toys, foods, videos or other comfort objects that will help put your child at ease. Your presence during the dental appointment is key. Because you'll be the most familiar face in the room, you can help keep your child calm and distracted during the visit. Although it can be difficult to stay calm while your child is having a hard time, being there and showing you're there to support them will make your child feel safer and at ease. Our Delta children's dentists happily treat children with special needs. Contact us today to learn more about our practice and book an appointment for your child.